Heather completed her undergraduate and Honours degrees at the University of Adelaide in 2006. For her honours project, she investigated the mechanisms driving vegetation change in sheep-grazed chenopod shrublands in South Australia. Heather has worked as a research assistant studying the relationship between feral cats, foxes and dingoes in the arid zone, an ecological consultant and in natural resource management for local government. 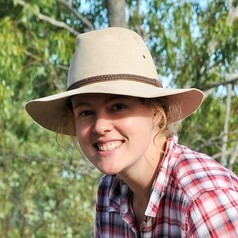 She recently moved to Townsville to pursue a PhD looking at the effects of different cattle grazing regimes on vertebrate and invertebrate community assemblages.